At Bumble Bee Pedi-Cab, we understand that sometimes it’s helpful to hear from others about our services. MJ was the best! We asked him to take us over a mile away to our hotel and he did! Good music and he was very funny! Loved him! We love you MJ! Love the 4 crazies from pride!!! You rock! Hope to see you again!! Rose M.
We were in desperate need of a ride and assistance. We had attended a Symphony concert at the Orpheum. My husband had dropped me off and then went to park the car. He proceeded to get lost. VERY lost. I took ill and was doubled over in pain and we had walked all over downtown to find the car to no avail. I couldnt bear to walk any further, being in so much pain. I came upon Stan and asked for his help. He drove us all over for probably a good 45 minutes…checking out every possible parking garage before my husband recognized the right one. Then he realized he needed his entry ticket to access the garage gate…which he of course left in the car. Stan was right on it…calling security and when they arrived, he stayed with me while my husband looked for the car. Stan was extremely helpful, polite, positive and kind. Very good natured and patient and even played cool music to listen to. 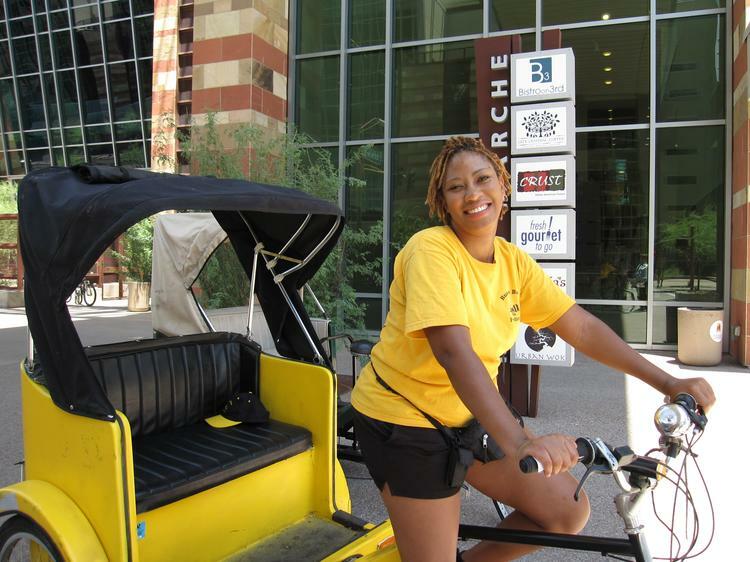 If you need a ride downtown Phoenix…look for Stan…or listen for his stereo! Would recommend him in an instant and would trust him with my grandmother! God bless him…he saved my life tonight. Rev. CarrieAnn T.
Stan the man gave us the best ride ever. My daughter said she wanted to come downtown just to get a ride with him again. Good music and contagious personality. Stan is the man	 Luisa L.
Do you have any comments? Please click here to submit your testimonials. We would love to hear from you!